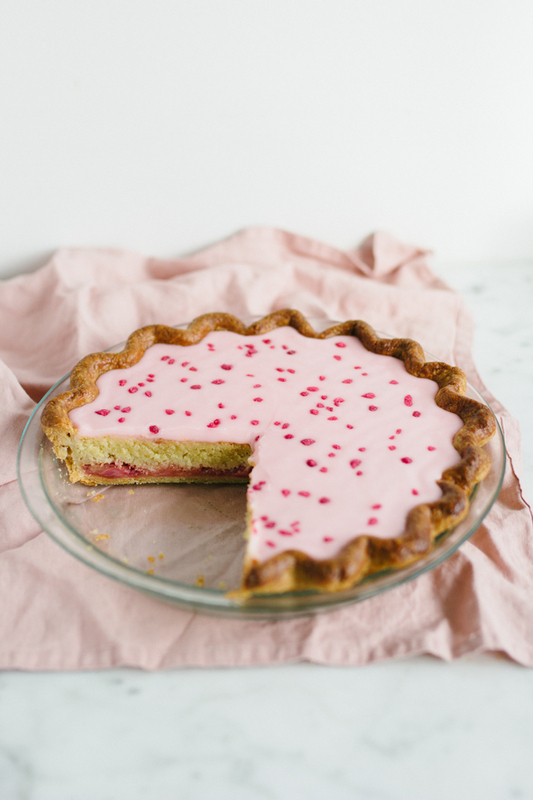 I’m having a pie moment and according to this blog, it’s an on-going moment that has lasted four glorious months and shows no signs of ending. From the outside, this particular pie looks like it has the chicken pox virus but if you dig deeper you’ll see that it’s a Bakewell tart disguised as an American style pie (my favourite rendition of any dessert with a pastry base). What gives this pie it’s alarmingly basic ‘twist’ is that instead of using a jam on the base, as is traditional with Bakewell tart, there is a layer of beautifully pink roasted rhubarb, of which the juices are used to make the water icing that is spread on the top of the cooled frangipane topping. I loved this pie, but it’s not a dessert, so treat it as something to have a slice of next to an afternoon cuppa. I’ve noticed through testing tons of pies recently, that you shouldn’t listen to a recipe that tells you to blind bake for 20 minutes unless you want a soggy bottom. I recommend 30 minutes and then gently lifting the baking beans and checking the bottom. If it’s pale or appearing raw, bake for another 5 to 10 minute until golden brown, and if you need to, put foil around the edges to prevent burning. Start by making the pastry. Put the flour, sugar and salt in a food processor and blitz to combine, then add the butter and pulse to breadcrumb consistency. Pour in the egg yolk and water and pulse again. As soon as a ball of dough takes shape, stop the mixer. Pour the crumbly dough on a layer of cling film, then lift up the sides and press together to form a disc. Let the dough rest in the fridge for half an hour. Roast the rhubarb: begin by preheating the oven to 180C/160 fan. Cut the stalks into 2 inch chunks and place in a single layer in a roasting tin. Sprinkle over the sugar, zest and orange juice, then cover with foil and roast in the oven for 15-20 minutes, the rhubarb should feel tender but still hold its shape. Put the rhubarb through a sieve to separate the juice from the fruit. Don’t press down, just let the juices run naturally – you still want some juice in there. Roll the pastry on a lightly floured surface, it needs to be large enough to cover a 9-inch pie plate with overhang and should be the thickness of a £2 coin. Place the dough in the pie plate and trim the edges so you have an inch of overhang. Fold the excess pastry into itself to create a thicker lip around the pie. Use your thumb and index finger to crimp the edges, then place the pie in the freezer for 20 minutes. While the dough rests, preheat the oven to 170C/190 fan. Blind bake for 30-40 minutes, remove the pie weights and reduce the oven temperature to 160C/180F. Egg wash the pastry case and put back in the oven for 5-10 until the shell is golden, then let the pie shell cool slightly. In the meantime, make the filling. Cream the butter and sugar for five minutes until pale. Add the eggs one at a time, beating between each, then fold in the ground almonds and set aside. 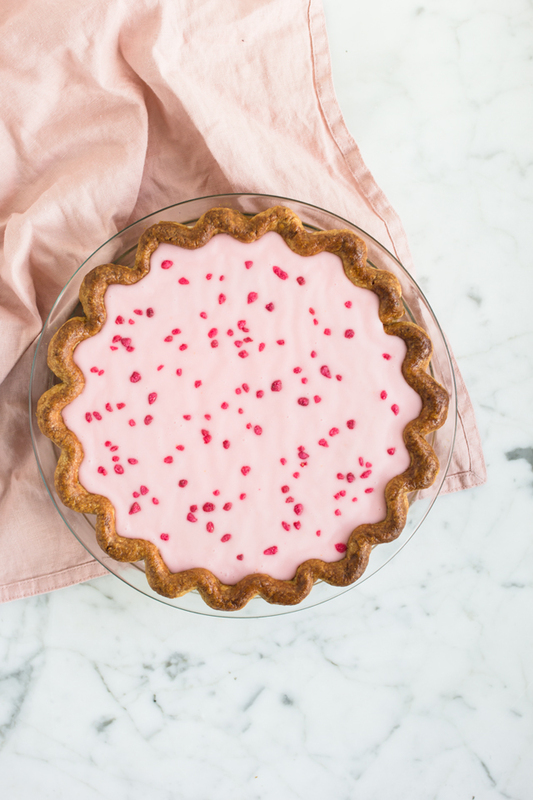 Spoon the strained rhubarb into the bottom of the pie shell so you have an even layer at the bottom. If it looks dry, drizzle some of the excess juice over the top. Fill a piping bag with the frangipane and pipe the mixture on top of the rhubarb. Doing it this way helps to prevent the rhubarb mixing with the frangipane, but you can carefully spoon it on top if you don’t have a piping bag to hand. Smooth the top, then foil the edges of the pastry and bake for 35 minutes or until a skewer comes out clean when inserted into the center of the frangipane. Leave to cool completely. Whisk the remaining rhubarb juices with the icing sugar, adding more or less of each until you reach a thick but pourable consistency. Pour the icing over the cooled pie and spread to the edges. 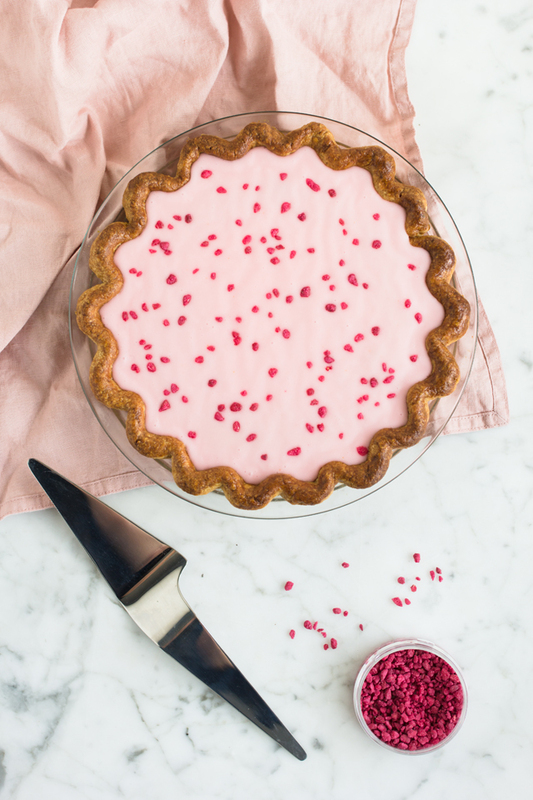 Sprinkle with rose pieces before the icing sets, then set aside for 10 minutes before serving. This is such a pretty pie, and I've got serious envy of how neat your pastry edges are!